Strutting their stuff behind Robert Zimmerman is fine by Tom Petty and The Heartbreakers, one of the finest American rock 'n' roll bands of the past decade. 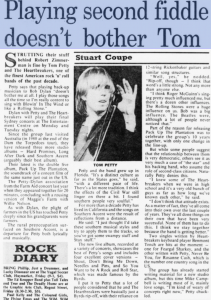 Petty says that playing back-up musician to Bob Dylan "doesn't bother me at all. I play those songs all the time so I'm really content to sing with Blowin' In The Wind or Like A Rolling Stone." Dylan with Petty and the Heartbreakers will play their final Sydney concerts at The Entertainment Centre on Monday and Tuesday nights. Since the group last visited Australia (in 1980 at the end of the Damn the Torpedoes tour), the have released three more studio albums -- Hard Promises, Long After Dark and Southern Accents (arguably their best album). Their latest is the double live album, Pack Up The Plantation, the soundtrack of a concert film of the same name just out in the US. The Petty-Dylan association from the Farm Aid concert last year when they appeared there for 20 minutes, concluding with a rousing version of Maggie's Farm with Willie Nelson. As with Dylan, the plight of farmers in the US has touched Petty deeply since his grandparents were farmers. The rural preoccupation surfaced on Southern Accents is a departure for Petty both lyrically and musically. Petty and the band grew up in Florida. "It's a distinct culture as far as the States goes," he said, "with a different pace of life. There's a lot more tradition. I think the effects of the Civil War still linger on there a bit. I found southern people very soulful." 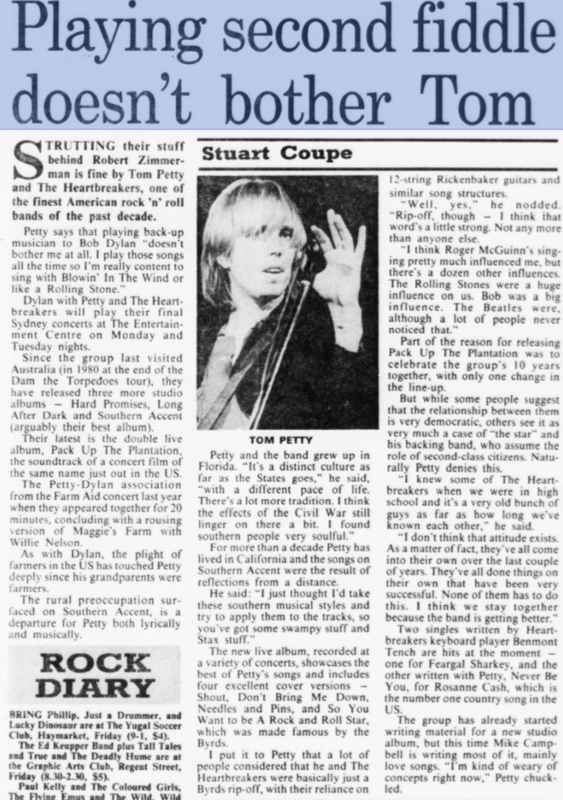 For more than a decade Petty has lived in California and the songs on Southern Accents were the result of reflections from a distance. He said: "I just thought I'd take these southern musical styles and try to apply them to the tracks, so you've got some swampy stuff and Stax stuff." The new live album, recorded at a variety of concerts, showcases the best of Petty's songs and includes four excellent cover versions -- Shout, Don't Bring Me Down, Needles and Pins, and So You Want to be A Rock and Roll Star, which was made famous by the Byrds. I put it to Petty that a lot of people considered that he and The Heartbreakers were basically just a Byrds rip-off, with their reliance on 12-string Rickenbacker guitars and similar song structures. "Well, yes," he nodded. "Rip-off though -- I think that word's a little strong. Not any more than anyone else. "I think Roger McGuinn's singing pretty much influenced me, but there's a dozen other influences. The Rolling Stones were a huge influence on us. Bob was a big influence. The Beatles were, although a lot of people never notice that." Part of the reason for releasing Pack Up The Plantation was to celebrate with the group's 10 years together, with only one change in the line-up. But while some people suggest that the relationship between them is very democratic, others see it as very much a case of "the star" and his backing band, who assume the role of second-class citizens. Naturally Petty denies this. "I knew some of The Heartbreakers when we were in high school and it's a very old bunch of guys as far a how long we've known each other," he said. "I don't think that attitude exists. As a matter of fact, they've all come into their own over the last couple of years. They've all done things on their own that have been very successful. None of them has to do this. I think we stay together because the band is getting better." Two singles written by Heartbreakers keyboard player Benmont Tench are hits at the moment -- one for Feargal Sharkey, and the other written with Petty, Never Be You, for Rosanne Cash, which is the number one country song in the US. The group has already started writing material for a new studio album, but this time Mike Campbell is writing most of it, mainly love songs. "I'm kind of weary of concepts right now," Petty chuckled.